MEMBERS IN THE NEWS RECIPE OF THE MONTH EVENTS CALENDAR SPOT THE MARK! ABOUT COMMISSIONER SID MILLER Sid Miller is an eighth generation farmer and rancher and the 12th Commissioner of Agriculture for the great state of Texas. Commissioner Miller has devoted his life to the agriculture industry, and supporting Texas producers and the communities they call home. He is a businessman, rancher, community leader, former ag teacher and former school board member. Commissioner Miller is a rodeo cowboy and holds nine world championship titles. He is an honors graduate of Tarleton State University in Stephenville, where he received a Bachelor of Science in Vocational Agriculture Education. A GO TEXAN Member won HEB's Quest for the Best! Is Your Wine A Blue Ribbon Winner? With GO TEXAN, you get the best of Texas. And remember, when you shop, travel and dine out, you are supporting Lone Star businesses, communities and the hard-working Texans behind them! he GO TEXAN marketing program, launched in 1999, adds a new dimension to the promotion of Texas agriculture. For nearly 20 years, this award-winning campaign has highlighted a wide variety of agricultural products under one easily recognizable trademark, a glowing brand in the shape of Texas. This publication is created using funding dedicated to marketing Texas goods and products. 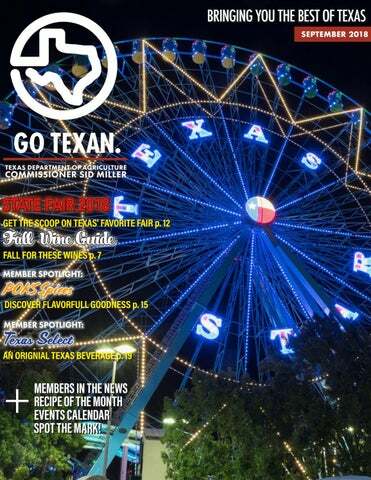 This Month Kicks Off the State Fair at the GO TEXAN Pavilion! Congratulations to our GO TEXAN member mmmpanadas who won the H-E-B Quest for Texas Best Grand Prize! This year, over 700 Texas food producers entered for a chance to be considered and invited to compete. The competition was held at the Austin Food Bank where the top 25 selected contestants presented their best with passion and excellence. Winners recieved coveted shelf space with H-E-B and $70,000 in prizes. For the last five years, H-E-B has set out on a quest to find the best in Texas – the best local products made by Texans! From the Panhandle to the Rio Grande Valley, from West Texas to Beaumont, the H-E-B Primo Picks: “Quest for Texas Best,” is an open call for locally owned, small food and beverage suppliers to have their items considered for placement on H-E-B shelves. You can find mmmpanadas food truck that lives at Austin’s Mueller development and mmmpanadas food trailer that operates outside of Barton Springs Pool at Zilker Park. mmmpanadas are also available as GO TEXAN fresh foods in specialty grocers including Wheatsville Co-Op, Royal Blue Grocery, Thom's Market, CoffeePeople inside BookPeople, Food Food, and will soon be on your neighboorhood H-E-B shelves. Vision Partner at the 2018 Texas Chefs Association (TCA) Convention in Houston, Aug. 3rd-5th. The convention was hosted by the Houston TCA chapter and attended by chefs from across the state. "The TCA Convention is an excellent opportunity for chefs to come together to learn, network and discuss what is happening in their industry. GO TEXAN is proud to support a great group of chefs working to improve their craft and carry on the vision of the culinary industry in Texas," said GO TEXAN representative Kristin Lambrecht. During this three day event, chefs had the opportunity to attend pastry demonstrations, learn about beef, expand their knowledge about Texas wine and cheese pairings and attend other educational sessions. Industry leaders also spoke about where the culinary and hospitality industry is headed. represented at the North American Agricultural Marketing Officials (NAAMO) Conference in Calgary, Alberta, Canada Jul. 22nd-25th. The conference bought together marketing representatives and leaders from across the country to learn and share agricultural opportunities and successes in each of their states. "NAAMO is a terrific conference that allows TDA to showcase the diversity of Texas while collectively discussing programs and issues facing the agriculture industry today," said TDA representative Bobby Champion Jr. The conference, hosted by Canadian agriculture officials, included terrific speakers and world-class tours that highlighted agriculture in Canada. "This is a great group of individuals and outstanding organization built around promoting and marketing all facets of agriculture today." spent three days in San Antonio at the Texas Nursery and Landscape Expo. Texas Department of Agriculture (TDA) staff Jami McCool and Scott Sroufe represented GO TEXAN, and joined Ashley Millegan from TDA "Donâ&#x20AC;&#x2122;t Pack a Pest" program as exhibitors during the conference. The conference provided networking and educational opportunities and exciting keynote speakers. to experience Christmas in August! Well, it wasnâ&#x20AC;&#x2122;t officially Christmas, but it felt that way. Texas Department of Agriculture (TDA) representative, Manuel Martinez, attended the Texas Christmas Tree Growers Association (TCTGA) Conference in Tyler. Manuel enjoyed networking with other TCTGA members and provide resources to help promote Texas Christmas trees this holiday season. Member Opportunities MEMBER SPOTLIGHT As a Tier II GO TEXAN member, you have a great opportunity to highlight yourself in this special section, just answer the questions below. Tier 2 or higher members will be prioritized, but all members are welcome to submit information. To upgrade your GO TEXAN membership, please email us. ➢	Provide TDA with a brief history about your GO TEXAN business. ➢	Provide TDA with one example of how you feature the GO TEXAN mark. ➢	Tell readers why being a GO TEXAN member is important to you? If your GO TEXAN business or product has received positive coverage in the news recently, TDA wants to know. Simply send us a link about what was said along with a picture so we can tout your success. It’s that easy! If you are planning a new event, or part of an existing one with GO TEXAN member opportunities, let TDA know. We want to make sure fellow GO TEXAN members have an opportunity to participate. GO TEXAN RECIPE OF THE MONTH If you are a GO TEXAN member and have a recipe to share, send it our way! Your recipe must feature Texas products, come with high-resolution (300 DPI) photographs and come with clear and precise cooking ingredients and directions. In keeping with the State Fair of Texas mission of promoting agriculture, education, and community involvement, GO TEXAN is happy to introduce the State Fair’s new Blue Ribbon Wine Selection program. Sponsored by GO TEXAN and in partnership with the Texas Wine Advocate, 12 of Texas’ best wines were selected from a pool of more than 100 entries. This program supports local agriculture, educates visitors on the best Lone Star wines, and brings communities of people together to enjoy a glass of Texas flavors at the State Fair Wine Garden. To get the full lineup of the winners, click here. It’s the time of year when I start dreaming of cooler temperatures and the holiday season that’s around the corner. Here are some of my fall favorites that will take me from football season to the new year. style blends, made predominantly with Grenache, Syrah and Mourvèdre. Try the Pedernales Cellars 2016 GSM, Fall Creek Vineyards 2015 GSM, or the Salt Lick Cellars 2015 GSM – all showing cherry, earth, and rustic notes. Malbec and Merlot are making some fine wines in Texas – the Lost Draw 2016 Malbec and the Kuhlman Cellars 2015 Malbec-Merlot both offer red and black fruit notes, with a smoky, peppery finish. The Landon Winery Merlot Reserve 2015 offers a Bordeaux-style wine with juicy black fruit, leather and cigar box notes. Texas also shines with Cabernet Sauvignon blends – look for Llano Estacado Viviano 2015 (+Sangiovese), Brennan Vineyards Winemakers Choice IV (+Syrah and Aglianico), Grape Creek Vineyards Cab Trois 2016 (+Cabernet Franc and Ruby Cabernet) and the Spicewood Vineyards 2015 The Independence (+Merlot and Malbec). For Cab Franc lovers, check out the Lost Oak Winery 2016 Cabernet Franc. Count on grippy tannins with notes of red and black fruit, leather, mocha, savory herbs and pencil shavings. One of the newer grape varieties showing promise for Texas is Tannat. A big, bold red grape yielding wines that are perfect for steaks, barbecue and other hearty fare. Pick up the RLV 2015 The Tempest, a Tempranillo-led blend with Tannat and Merlot, William Chris Vineyards 2015 Tannat or Bending Branch Winery 2015 Texas Tannat. Finally, I’m seeing more Texas winemakers experimenting with Sagrantino, an Italian grape variety from central Italy – often compared to Aglianico from southern Italy (for a Texas example, try the Duchman Family Winery 2015 Aglianico). The Messina Hof 2016 Sagrantino Reserva is a juicy and opulent red wine–pick one up for your next dinner party. Apple Fun Facts! •	Apples are a member of the rose family. •	Twenty-five percent of an apple’s volume is air which causes them to float. •	Apples are rich in pectin which helps fight body toxins and aid digestion. •	Apples are “nature’s toothbrush.” The mild fibrous texture, and juice content helps to cleanse teeth. •	Apples contain zero fat per serving while giving 5 grams of fiber. •	Apples should be kept refrigerated as cold as possible without freezing. is simple, right here in Texas! When talking about Texas produce, especially fruits, we are usually drawn to thoughts of grapefruit, oranges, watermelons and peaches. But, we should never forget the Texas apple! Tree ripened Texas apples hold up well under the hot summer sun. Since they stay on the tree longer they tend to have a higher sugar content. That gives Texas apples a noticeably sweeter flavor. GO TEXAN member, Bryan Huntzler, owner of Love Creek Orchards in Medina was asked, “What seems to be the favorite variety of apples among your customers?” “Some like them tart and others like sweet,” says Huntzler. No matter your preference, you can find them in Texas! Love Creek Orchards began when Baxter and Carol Adams planted their first apple trees in 1979. Bryan Huntzler and his wife Stacie bought the orchard in 2013 along with The Apple Store. He says that they are having a good harvest in 2018 after no crop in 2016 and 2017. At this time, the orchard is in the process of replanting. Huntzler says that they currently have Gala, Fuji, Jonathan, Goldina and Gold Rush. They are replanting Anna, Dorset Golden, Pink Lady and Granny Smith varities. With the replanting, he expects future harvests to be up over the next five years. Huntzler says that he intends to keep apples in the Hill Country. At Love Creek Orchards, he is not only a source for apple pickers but also the aspiring apple grower. He is knowledgable of both trees and a go-to for those who would like to grow their own apple trees. If you’re taking a day trip to the Texas Hill Country, you want to stop by Love Creek Orchards, located on TX-16 in Medina. During apple season, they offer fresh picked and pick-your-own apples (when the harvest allows), delicious apple ice cream, pies, and other treats. During the off season the Huntzlers' offer family activities such as a pumpkin patch complete with a hay maze. Commissioner Sid Miller was elected President of the Southern U.S. Trade Association (SUSTA) at the annual board meeting. SUSTA, a non-profit organization, is made up of the Departments of Agriculture in 15 southern states and is chartered to facilitate exports of U.S. food and high value agricultural products by small to medium-sized companies in the region. Products exported with the support of SUSTA’s marketing activities ranged from snack foods to distilled spirits, and from sauces to nursery plants. Since 1973, SUSTA has worked with the Departments of Agriculture of the 15 southern states and Puerto Rico to promote the export of agricultural products. Commissioner Jason Fearneyhough attended Palermo’s Expo in Buenos Aires, Argentina Jul. 27th – 29th. Fearneyhough was accompanied by International Program specialist Gaston Davis and in-country consultant Enrique Crotto. One of TDA’s goals is to enhance trade between Texas and Argentina. The group met with livestock producers from all over South America along with U.S. and Argentine agricultural officials. “We’re looking forward to promoting genetics from Texas into Argentina. We are most interested in promoting Brahma, Braford and Brangus Cattle. It’s an important market for us to open up,” responded Fearneyhough when interviewed at Palermo. Furthermore, the Texas Department of Agriculture representatives visited the Bosch Palace, home of U.S. Ambassador to Argentina Ed Prado, and welcomed U.S. Secretary of Agriculture Sonny Perdue, who announced the importation of U.S. Pork. Cultivating great relationships, and creating new ones for future trade and commerce, is a mission the Texas Department of Agriculture takes seriously to ensure that we are always taking Texas worldwide. Comes Together For 48 years, the GO TEXAN Pavilion at the State Fair of Texas has highlighted the importance of Texas agriculture. With GO TEXAN serving as the marketing catalyst, state wide businesses, products and merchandise are on full display for 24 fun-filled days. Don’t miss this once-a-year opportunity to experience the best of Texas; from Big Tex to football, corn dogs to cotton candy, the GO TEXAN Pavilion is the place to be and where Lone Star dreams come true. inside TDA’s GO TEXAN Pavilion, you will: •	Receive a GO TEXAN Recipe Book (with General Store purchase). •	Receive TDA’s commemorative State Fair poster (free while supplies last). •	Receive free ice cream from Southwest Dairy Farmers. •	Visit with representatives from Texas Farm Bureau. •	Stay entertained at the GO TEXAN Event Stage – Click here for a list of daily events. •	Visit the Pioneer Brand General Store featuring hundreds of GO TEXAN member products and goods. There are plenty of sampling opportunities available too: •	Visit with GO TEXAN Exhibitors including the Texas Beef Council, Texas Forestry Association, Texas Beekeepers Association, Texas AgriLife Extension and TDA's Food and Nutrition Division. •	State Fair of Texas Wine Garden: Come by, relax and sample some of the best vintages in Texas. •	Howdy Neighbor! Visit with GO TEXAN Rural Community representatives about your next Texas getaway. The State Fair of Texas is the world’s greatest showcase for all things Texan. Delivering on that promise, we expect that you, and 3 million of your friends, will come say hello and experience some true Texas hospitality. the ferris Take a ride on wheel! Stop by our booth for a sweet treat on us! Rec ip e B oo k with purchase from the General Store! Q: Give us a brief history about y'all and your GO TEXAN business. A: While growing up in Ghana, Daddy would send me to pick fresh spices and herbs from his farm to blend into seasonings, which we used to make the many dishes that we cooked together. When we moved to the US many years ago, it became difficult to keep up with the tradition of preparing freshly blended wet seasonings for each meal. Therefore, in July 2016, we launched POKS Spices to introduce authentic Ghanaian flavors to American homes in the form of dry seasonings. Our award-winning seasonings have been crafted and blended using spices typically found in every Ghanaian home. Just as the Cajuns have the holy trinity of onions, celery and bell peppers, West Africans have the holy trinity of hot peppers, onions and ginger. In developing our seasonings, we built upon this holy trinity, while incorporating in other spices. Our cayenne-based All Purpose Seasonings are versatile and can be used for meats, poultry, seafood, vegetables, stews, soups, sautéing, frying, grilling, boiling baking, marinating and so much more. The All Purpose Seasonings come in two forms; Original “Daddy’s Recipe” and Extra Spicy “Mama’s Recipe”. Our Original All Purpose Seasoning is dubbed, "Daddy's Recipe" in honor of Daddy, who taught me how to blend seasonings and to cook. Our Extra Spicy All Purpose Seasoning is dubbed, "Mama's Recipe" in honor of Mama, who taught me to love all things extra spicy. Q: How do you feature the GO TEXAN mark? A: The red version of the "GO TEXAN" mark is used on our product labels. Q: Tell readers why being a GO TEXAN member and sourcing local is important? A: When we came across the GO TEXAN table at Zest Fest 2017, we knew that we wanted to be a part of a body that supports locally-made Texan products and businesses. Having that support as a minority-owned small business is very important to us, because not only does it help us to identify with a larger network of other Texan businesses, but also provides essential resources that help us grow and reach a bigger network. Also, through the GO TEXAN mark, customers are able to identify our business as local. That gives more incentive for them to patronize us. Did you know that the Prickly Pear Cactus is the state plant of Texas? The deep red fruit of the prickly pear cactus is referred to as tuna and most are edible. The broad stems, or pads (nopales), are also edible. A: After looking into ways to provide plant-based foods to my fellow Texans and the world, I landed on one of my all-time favorites: Jerky! I spent over a year perfecting the bold flavors and creating the packaging and marketing aspects, as well as manufacturing and distributing. We are the premier Texas plant-based snack foods company with Itâ&#x20AC;&#x2122;s Jerky Yâ&#x20AC;&#x2122;all, the future of jerky. At All Y’alls Foods, our focus is to replace snacks that traditionally had animal involvement with a much tastier and enjoyable snack that is safer for every body. So in addition to being a tasty plantbased snack, It’s Jerky Y’all is a Texas-themed product that includes things like the prickly pear puree (did you know it is the state plant?). We also use roasted chipotles and pecan smoke all flavors tied to Texas. Q: How do you feature the GO TEXAN mark? A: After much consideration, we placed the logo where it fits best. In this rendition that we are currently producing, it is on the back and we also have it on the bottom of our website and banners. Q: Tell readers why being a GO TEXAN member and sourcing local is important? A: When I was creating this company, I realized that one of the things I am proud of is that I am a native Texan and that this state means a great deal to me. There were no questions about becoming a GO TEXAN member. We are proud to be a part of the nation’s greatest state, and the GO TEXAN program is a perfect fit. It’s Jerky Y’all is just one of the dozens of snack foods we will grow into with four more flavors in the works each representing a different region of Texas. I have enjoyed touring the GO TEXAN store at the State Fair for years and always knew I wanted to be in it, and we will be this year! A: The Texas Select Beverage Company (TSBevCo) story began in the late 1970’s when my father and Texan native, Manny Zelzer, became compelled to fill a void in the world beverage market - the need for a great tasting non-alcoholic version of the classic American beer. Manny was a true entrepreneur and was always exploring innovative ideas. After fifteen months of research and development focusing on quality, taste and packaging he finally perfected and produced Americas Original NA, The Texas Select NA Beer. Brewing began and continued for the next 15 years in the famous San Antonio Brewing Association building, Pearl Brewery. Using his international contacts Manny quickly developed Texas Select NA sales in the Middle East, Canada, Japan and Korea. Once underway overseas, he directed his attention back home, putting everything he had into the business, first in Texas and then across the country. At this point I joined the business and started marketing Texas Select NA the old-fashioned way, sponsoring charity events, chili cook-offs and community activities. In just a few years, the Texas Select NA brand caught on and became well known coast-to-coast. My father and I pioneered the Non-Alcoholic Beer niche market in Texas , throughout the U.S. and beyond. In 2008, Texas Select Beverage Company introduced Fresh Brewed Teas and Coffees to its product portfolio and a new era for the company began. Our Texas Select NA had been sold in Texas restaurants for years, so teas and coffees were a natural fit for the Company’s customer base. The Company brings in tea by the tons, then flavor, blend and pack their Signature Teas. We always have something brewing in “The Kitchen” (the tea/coffee R&D lab) with new tastes and smells daily. Through the years, we have created dozens of interesting teas and coffees to join the TSBevCo product family. Manny Zelzer and Daughter Martha Zelzer. We work hard to capture the essence of Texas in all of our products. Visiting with the Watermelon Growers in Luling Texas is just one example. Did you know there are more than three generations of Watermelon growers in Luling? Our Texas Select Watermelon Tea has been a customer favorite and best seller for years. You can drink glass after glass and still want more. We have customers in over 20 States, Korea and Japan, however, the lion share of our business remains here in the Great State of Texas! We encourage all Texans to get out regularly and listen to some Texas music, drink some Texas beverages and mix with friends. Beyond our dedication to beverage production and development, we are all about Texas Spirit and our Texas Roots through support for Texas Charities and Texas Music. Q: How do you feature the GO TEXAN mark? A: Texas Select Beverage Company makes extensive use of the GO TEXAN mark. The Company proudly displays the GO TEXAN mark in its social media postings, product labelling, web pages, advertising and trade show promotions. The GO TEXAN mark is an important part of the Company's statement to the world that we are Texas madeand Texas Proud. Q: How do you feature the GO TEXAN mark? A: Texas is our First name and we take it seriously. So, it is with great pride that we fly the GO TEXAN banner. It is part of our Texas heritage that makes us want to do everything we can to help promote all things Texas. This is something we have in common with the GO TEXAN team and our fellow GO TEXAN members. TSBevCo also brews teas and coffees. The Houston Livestock Show and Rodeo™ invites you to participate in our 16th annual Rodeo Uncorked! International Wine Competition. As one of the largest International Wine Competitions in America, our Competition is judged by local and national experts with extensive wine credentials. Judging is based on a double-blind procedure and audited on site by PricewaterhouseCoopers, ensuring the highest integrity. For 2019, the featured region will be California, Central Coast. Wines from this area will be eligible for additional awards. Thanks to the participation of more than 1,100 wineries worldwide, we had 3,200 entries in 2018! Over the last 16 years, the Rodeo Uncorked! International Wine Competition has continued to grow and be recognized as a premier wine contest, while supporting one of the state’s strongest charities. The Houston Livestock Show and Rodeo™ promotes agriculture by hosting an annual, family-friendly experience that educates and entertains the public, supports Texas youth, showcases Western heritage and provides year-round educational support within the community. Since its beginning in 1932, the Rodeo has committed more than $450 million to the youth of Texas. Eligibility Requirements All entries must be distributed in Texas and commercially available February March 2019, during the Show. For a complete list of requirements, please review the Handbook, which can be found at rodeohouston.com/wine. » Listing of all medal and premium awards on the Show’s website and local media outlets. » Exposure for Class Champion, Reserve Class Champion and Double-Gold medalwinning wines to high-end consumers, trade and media at the Roundup & Best Bites Competition on Feb. 17, 2019, and the Champion Wine Auction & Dinner on Feb. 24, 2019. » Ability to cite earned International Competition Awards in all public relations and marketing. » Access to high-resolution formats for point of sale materials, including bottle-neckers, shelf-talkers, posters, etc. » Access to digital medals for use in online and print marketing campaigns associated with award winning wines. » Top award winners annually receive media coverage online and in publications such as Southwest: The Magazine, Houston Press, Houston Chronicle, Houston Business Journal, and local news and radio stations. » Top performing Texas wineries will be featured in Texas Monthly Magazine in early 2019. » The top performing Texas wineries will also be invited to participate in Texas Wine Celebration Day in the Champion Wine Garden during the 2019 Houston Livestock Show and Rodeo. ORIGIN (Central China): The tea delivers great clarity, light steady character & a rich orange red color -ideal for our Flavored Black Family Packs. ORIGIN: A blend of premium black teas from several premier world gardens. The tea brews crystal clear with brilliant orange red color & a rich character. An American favorite for years, you will love the taste and finish of this tea. -Apricot Peach Green ORIGIN (South Central China): The tea delivers sweet mellow -Blueberry Green character, modest astrengincy & no grassiness -ideal for our Flavored Green Family Packs. September 4 - 7. Ideal for new exporters who want to learn about the Canadian market and one-onone meetings with food buyers. FARM AND TABLE NEW ORLEANS - CHEF'S TASTE CHALLENGE [website] New Orleans, LA Texas squash and zucchini are featured on the Chef's Challenge menu! September 7-9 at Dallas Market Hall. Connecting Texas Home and Garden professionals with Texas Homeowners! Special booth rates for GO TEXAN members! September 7-9 at Wildseed Farms. Daily lectures and demonstrations by John R. Thomas showing successful and timely wildflower planting techniques. 9TH ANNUAL FREDERICKSBURG PROFESSIONAL BULL RIDING [website] Fredericksburg Real Rodeo excitement in this highly rated PBR event! Texas wineries, Texas craft beer, live music, culinary demos and more! Harker Heights Community Park. Register for tickets on website. From Sept. 10-13. Includes a chance to schedule one-on-one meetings with buyers. If you are planning a new event or part of an existing one with GO TEXAN member opportunities, let TDA know. We want to make sure fellow GO TEXAN members have an opportunity to participate. Rodeo and fair activities September 14-22 at the Tri-State Fairgrounds. From September 15-16 at the NRG Center Hall C. Connecting Texas Home and Garden professionals with Texas homeowners! Special booth rates for GO TEXAN members! September 19-20. The Mexican Inbound Trade Mission to Georgia and Texas offers the unique opportunity to meet pre-qualified Mexican retail and food service buyers in an inexpensive way for SUSTA region suppliers. From September 28 - October 21. Celebrating all things Texan! From September 28-30 in downtown Bryan. Texas wine! Texas beer! Texas steak! Purchase tickets through website. Every Thursday from October 4-November 15 at the Grounds of the Pioneer Museum. "Get Fresh, Buy Local". Live music, prepared foods, cooking demonstrations, wine tasting and more. 4 - 7 PM. October 4-7 at the Historic Gruene Hall and The Grapevine. Four days of the best of Texas wines, live music and foods! Tickets through website. October 5-7 at the Marktplatz. Celebrate the fun and flavor of Fredericksburg's German heritage with three days of music, food, drink, dancing, arts, crafts and children's activities. Contact Eastland Chamber for more information. Vendor application here. October 11-14 at the Festival Grounds at Rockport Harbor. Four days of music, food, car shows, shopping and fun! October 11-14 at the Cuero Municipal Park. A celebration of Turkey-ness with music, food, events and shopping in this GO TEXAN certified retirement community! Tickets through website. Celebrating the Monarch Butterfly migration "tag and release" program. Fun and educational for the whole family! At Wildseed Farms. This annual fall festival is held at Winchester Park. Sponsored by the Chandler Chamber of Commerce and includes a parade, arts & craft vendors, food, chili cook-off and more. Annual fall festival with great craft vendors, lively entertainment and good food. Vendor spaces are available, go to the website for more information. October 16 - 20. A celebration benefiting the youth of Calhoun County and promoting Agricultural literacy. A celebration of Western Traditions! Rodeo, music, great food and fun! Providing homeowners with one-stop shopping for their Lone Star home and leisure lifestyle. Special discount available for GO TEXAN members for booth space. Contact Gina Mayfield for details. October 24-25 at the Victoria Community Center. Educational activities for the whole family, booths and exhibits, golf and more! A grand celebration of Texas food and wine with musical entertainment and fun plus several special events. At the Marketplatz on the corner of W. Main and N. Adams. An agricultural celebration with an emphasis on Texas pecans in this GO TEXAN Certified Retirement Community! Indulge in a leisurely stroll around the plaza to savor artisanal food, sample Texas wines, watch live culinary demos, shop carefully curated vendors, and enjoy live music on the plaza lawn. Tickets available on website. October 28, 12:00pm - 3:00 pm. Our festival attendees like to drink wine and shop! We are recruiting unqiue Texas businesses to come and participate in this fun events. The 2018 festival will have live music, artists, unique vendors, great food and of course great Texas Wine. November 3-4. The Top 50 BBQ Joints in Texas have all been invited. Come see who will be smoking at this weekend of 'cue! Plus, check out our exciting new weekend schedule including our first ever Texas Monthly BBQ Fest Franklin & Friends Kickoff event! Tickets Available on website. November 8-10. Hong Kong remains an important hub for the Asia Pacific wines and spirits markets. Consumers in Hong Kong are becoming more educated about wine from different regions. GO TEXAN Members will have the opportunity to connect with culinary enthusiasts throughout the weekend at the Big & Little Tent event. From the best cooking and grilling equipment to unique sauces, rubs, leather goods, and cookbooks, Cowabunga's Pop Up Shop will be open Saturday & Sunday. Members will receive up to 40% off the booth rates for this event. Contact srice@houstoniamag.com for more information. This annual festival features something to please everyone including educational activites, shopping, entertainment and much more. A special commemoration of the 100th anniversary of the ending of WWI featuring marching bands, vintage vehicles and equipment, floyover and WWI-era music concert. On Main Street & Marketplatz. Call (830)997-3758 or email for more information. Evening of wild game appetizers, beverages, live auction, raffle and silent auction benefitting youth and adult agricultural education in the Texas Hill Country. Call (830) 998-1815 for more information. Pecan vendors needed! Other vendor spaces may also be available. Visit the website for more information. DID YOU KNOW? H Olives are the 5th largest Texas perennial fruit crop. H Texas has more than 4,000 acres of olive orchards. H Green and black olives are the same olive, the difference is the age (maturity) of the olive. SEPTEMBER FUN FACT POSTER Collect them all! Click here to download. Heat oil in large nonstick skillet over medium heat until hot. Add mushrooms and 1 teaspoon garlic; cook and stir 2 to 4 minutes or until mushrooms are tender and browned. Remove to medium bowl; cool slightly. Meanwhile, combine remaining 2 teaspoons garlic and thyme. Press evenly onto beef steaks. Place steaks in same skillet over medium heat; cook 10 to 13 minutes for medium rare (145°f) to medium (160°f) doneness, turning occasionally. Remove to platter. Add tomatoes, salad greens and vinaigrette to mushrooms; toss lightly to coat. Season steaks with salt and pepper, as desired. Serve with salad. How many years have you been with TDA? I have been working with the Texas Department of Agriculture for 20 years. The diversity of my job is great! By working alongside city and county partners, I’m allowed the opportunity to market and promote local Texas businesses and through TDA’s GO TEXAN program. The 18 counties I cover encompass are a blended mix of farmland, ranch land, and coastal beauty. What differentiates the Rio Grande Valley from other regions is that it’s the only place in the state of Texas that grows sweet Texas Citrus and Sugar Cane. Region 8 has it all! Come on down and you can visit the King Ranch, enjoy our beautiful beaches, enjoy some authentic cuisine or just relax. It’s a great place to work and live! If you could visit any place in texas, where would you go? Too many to name, but here’s some travel advice. Stay off the interstates and highways and take all the back roads; here you’ll see the best of Texas and experience some genuine Lone Star hospitality. Note: I get to do this every day with my job. Messina Hof Winery and Resort co-founders, Paul Bonarrigo and wife Merril, have imported a Italian classic grape, the Sagrantino, to Texas. Sagrantino provides a deep, dark red wine that the Bonarrigos cannot resist. Nearly all of Sagrantino comes from Umbria and two Italian families have dedicated themselves to advancing this rustic grape with likely ancient origins from traveling Catholic monks around 1200 AD. Read the Edible Houston article to learn more. In keeping with the State Fair of Texas mission of promoting agriculture, education, and community involvement, we are happy to introduce the Fair’s new Blue Ribbon Wine Selection program. Not only does this program support local agriculture and educate visitors on the best Lone Star wine, but it brings communities of people together to enjoy a glass of great Texas flavors at the State Fair Wine Garden. Read the Morning Ag Clips article. Not even the 100-degree heat could keep thousands of attendees from tasting hundreds of hot sauces at the 28th Annual Austin Chronicle Hot Sauce Festival. Some winners included GO TEXAN members! Thanks to everyone who braved the heat and helped us benefit the Central Texas Food Bank! Read the Austin Chronicle article. 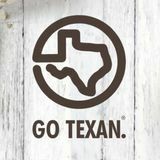 GO TEXAN is a marketing program of the Texas Department of Agriculture, promoting the products, culture and communities that call Texas home.